Modern Beauty Girl: Did I Complete My Summer Bucket List? I was totally not planning on doing this post, but I saw my friend Julie did a similar post on her blog, and I thought it would be fun to do here too! If you want to see her post, click here! I didn't get a chance to host as many parties as I would have liked over the summer (I love being the hostest! ), but I was able to throw one of my friends a surprise grad party, which was super great! P.S. if you wanna see how I did it, watch this video! Didn't get to do this nearly as much as I would have liked, but I went a couple times with my friends, and I hung out by the pool every day when I was in San Diego! Amusement Parks!I actually got to go to Universal Studios, Disneyland, and California Adventure over the summer, which was incredible! I had the best time there with my family, and if you want to see all of our adventures during the Cali trip, watch this video! I didn't read as much as I would have liked to either. I did re-read Paper Towns and the Divergent series, and I read a ton of magazines and articles, but I never got around to reading On The Road again, so that's definitely on my list for Christmastime! I am so excited for fall and I can't wait to actually see the leaves change (because they don't do that in Hawaii! ), wear warmer clothing, and have pumpkin spice everything! If you made a bucket list as a part of my stylish summer challenge, I would love if you did a similar post like this or just told me what you accomplished in the comments! Sounds like you had a lush summer!! I'm so jealous of your theme park adventures! 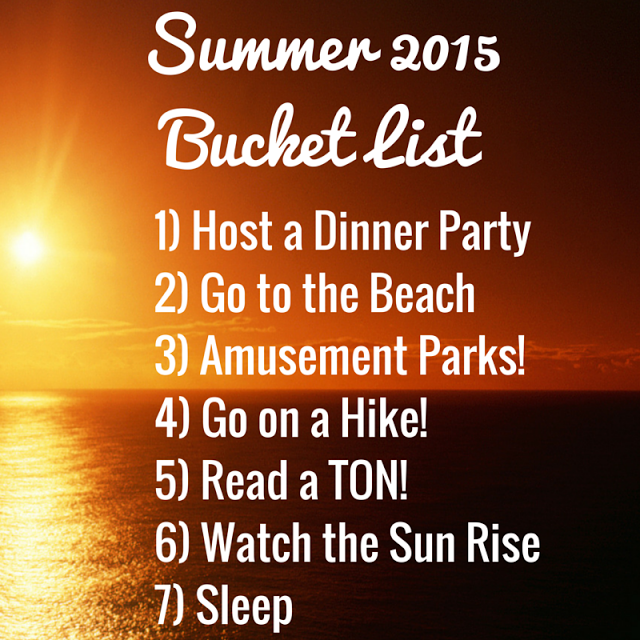 We are just coming into Spring/Summer now and I am so excited to do many of these things! woohoo! yeah it was definitely one of the best summers I've had in a while! enjoy the warm weather for me! it's starting to cool down where I'm at!